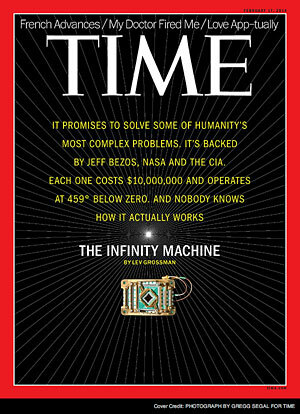 We recently received rock star status in our local network of manufacturers by having our PCB boards featured on the cover of the February 17, 2014 issue of Time magazine. Okay, it’s not the cover of Rolling Stone and the image is kind of small and fuzzy but still we were pleased. Now to be honest, the issue featured the work of one of our more prestigious customers: D-Wave Systems, Inc. and our circuit boards were only one part of the assembly shown on the cover. But still. Right? So what can you do with exposure like this other than trying to find ways to casually slip it into a conversation with family, friends, customers, suppliers, cashiers and busboys? Updating the home page of the website certainly seemed credible. Spamming the information to every email contact we had ever collected just seemed wrong. But perhaps a short blog about our exposure will suffice. We know the article isn’t about us or our fine-line Al-PCBs but about the amazing work one of our most respected customers is doing. To read an excerpt from the article and see a higher quality image of the device you just need to go here. Because you cannot see our silkscreened logo clearly in the image on the front cover, our work, along with the CNC machining company and the cable supplier, will largely be anonymous.